As shifting market dynamics increase barriers to patient retention, health systems must be increasingly attentive to providers' referral behaviors and gaps they encounter with today's referral processes. 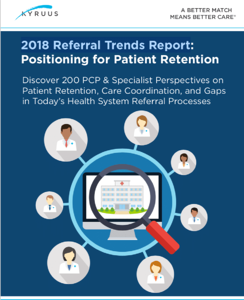 We surveyed 100 PCPs and 100 specialists across the US to understand their perspectives and identify opportunities to improve patient-provider matching and care coordination. Learn more - download your free copy of the report today!